guys i tried this morning and it worked, they fixed it! I have the same problem won't let me pay. Can you give me the google number so i can call? same as me,gosh whats that.Anybody solve? PEOPLE, THIS IS A GOOGLE PROBLEM! We're not Google. We're not PayPal. They WILL get it fixed. Until then you just have to wait. Posting here won't fix it faster. belodion and Laura Knotek like this. Has anyone tried using a google play gift card to see at least if that worked? I tried and I'm getting the same error as well. I've made the thread a Sticky so that we can find it easily. Laura Knotek and GladiusP like this. Is it outright denying the redeem code or were you able to put in money into your account, but can't buy anything? If I Can't buy anything in 48hours I'll request my money back! Click this link and fill out the questionnaire and your number and they will contact and assist you through it! Have a good day! Please help me to fix my unsuccess issues in rules of survival because i can't topup ineed to report it thankyou! I need help pls anyone. Power off phone for 1 min. Turn back on and then try to make a purchase. The only way to fix this is to call google support. They do a one time fix. It does not last. Managed to get one payment through after they said they fixed it. Noe im stuck with the same problem ad before. The same thing occurred to me yesterday. Had to finally call their support and after 1 hour on the line, they removed the error from my account. But one purchase later and it's back again! More and more people will have to keep complaining to google until they finally fix their crap. Some of the complainants who got in touch with support shared that it happened because their accounts were suspended. Thereafter, support unflagged their account, but that offered only a temporary relief. After making a payment or two the problem/error bounced back again. Looking at the proliferation of reports, one of the Google forum Top Contributors escalated the matter, soon after which came a response from a Google employee. They suggested the affected users to troubleshoot, informing that the error is related to rejected transactions. 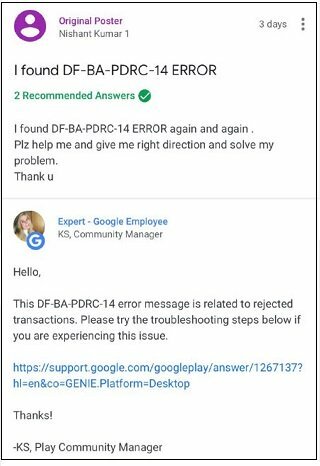 This DF-BA-PDRC-14 error message is related to rejected transactions. Please try the troubleshooting steps below if you are experiencing this issue. I made a new account to try and see if it's affecting new accounts as well as select other accounts. Using a $10 gift card I was able to buy 2 apps under $1 and a .99 cent in app purchase, but wasn't able to purchase anything larger without the message "An error occurred. please try again. [DF-BA-PDRC-14] ". This is a terribly inconvenient bug in the play store that basically locks people out of their Google balance and from purchasing things on sale or in apps during events, and needs to be sorted out the sooner the better.